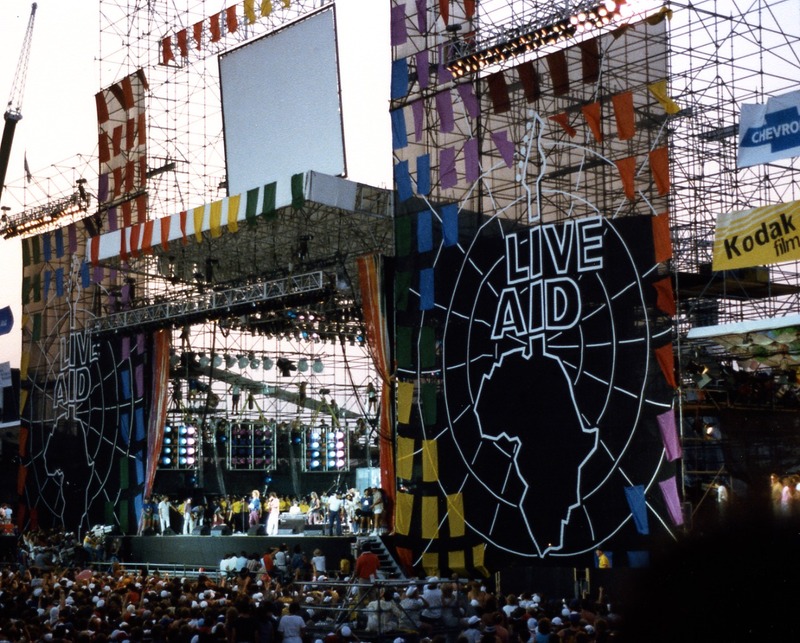 Live Aid at JFK Stadium, Philadelphia, 1985. By Squelle (Own work) [CC BY-SA 3.0 or GFDL], via Wikimedia Commons. The great famine of 1983-85 in Ethiopia was an important landmark in the history of global humanitarianism. The famine — following almost two decade of a civil war — was the worst to hit the country in more than a century, killing between 400,000 to 500,000 people. The famine sparked the attention of a widespread international community including aid organizations, journalists, human rights advocates, government representatives, the UN, and even Western celebrities. 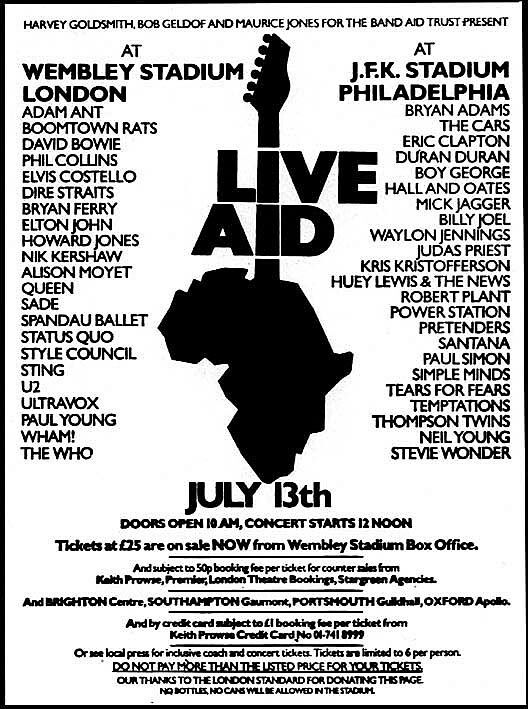 Most famously, the famine led to the creation of Live Aid — “the global jukebox,” as its organizers called it — a global concert, broadcast live across the world in an unprecedented satellite link-up to around 1.9 billion viewers. As such, the famine helped create a new popular culture of celebrity aid that commodified humanitarianism and helped generate millions of dollars for its aid business. Histories of the Ethiopian famine have focused mostly on its representation in the Western media. As they have shown, the representation of the famine in international news depoliticized the conflict rather than discussing its political and economic causes. The famine, however, offered an important episode within the history of global humanitarianism not only because of the size of the relief it attracted but also because of the paradoxes these relief measures brought. The famine brought a century-long tension between the politics of aid and postcolonial governance as the global Cold War echoed in the background of its relief. Many humanitarian organizations insisted on the apolitical nature of their relief, but in Ethiopia they were confronted by the implications and the politics of their aid programs. Recognizing the international interest in the relief, the Ethiopian government used aid for its own counterinsurgency purposes. Similarly to what Nyerere was doing in Tanzania, Ethiopian officials saw the famine relief as a way they could resettle and displace Tigrayans. At the same time, rebel groups sold food shipments from organizations such as Oxfam to the Tigrayans and used the profits to purchase weapons. Humanitarian techniques to saving lives, so it seems, were doing more harm than good. 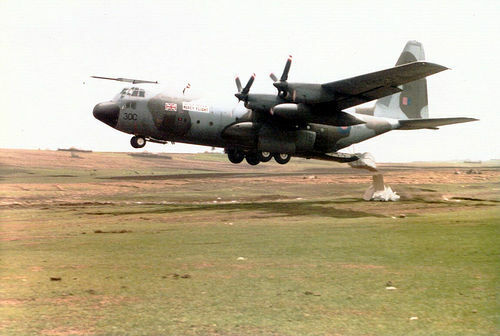 Royal Air Force C-130 airdropping food during the 1985 famine. By Talskiddy at English Wikipedia [GFDL or CC BY 3.0], via Wikimedia Commons. This media frenzy mobilized international response from across the world, as aid began to pour in support of the Ethiopian government. Clocked as famine relief, however, the Ethiopian government forcibly resettled and relocated its northern population in the attempt to battle rebels in Tigray. This resettlement program involved human rights abuses killing at least 50,000 people in their transit. As aid agencies scrambled to respond to the plight of mass hunger, they began to realize their relief efforts were utilized by the Ethiopian famine as a weapon of war. No institution epitomized this more than the famine relief camps of set up by international humanitarian agencies. The camps brought to the fore the paradoxes of humanitarian governance, as they were used not only as feeding centers but also as spaces of encampment and relocation. While humanitarian organization searched for spaces to relief a displaced population, the Ethiopian government determined the camps locations. Famine camps were not a recent invention. Their history can be traced back to what the historian James Vernon called “the humanitarian discovery of hunger” in the 1880s and 1890s India, when the British state had to respond to a large-scale famines in its colonial territory. The camps became part of new mechanisms to relieve famines and to control its colonial population. The camps were created as both spaces for relief as well as spaces to enclose a diseased and hungry population. In their postcolonial implementations, however, the camps were stripped of the political context from which they were created and became a new technology in the hands of humanitarians. Realizing the potential of this technology, the Ethiopian government manipulated it for its own counterinsurgency efforts. The aid community was fully aware of the paradoxes of its aid and was therefore left with a conflict or whether or not to help. Very few agencies —like Doctors Without Borders—have pulled out of the famine relief, the majority stayed despite what they saw on the ground. In 1985 about 90 percent of the aid was given to the government and to humanitarian agencies working on the government side in the attempt to maintain postcolonial sovereignty, despite the fact that they had access to only a minority of the famine-affected population. As the scholar and human rights activist Alex De Waal has shown, international assistance undoubtedly prolonged the Mengistu government's life as much of the aid served to support the counter-insurgency strategies of his government. The Ethiopian famine of 1983-84 and its relief crystallized the moral and political implications of what the anthropologist Didier Fassin has called “humanitarian governance.” That is, it challenges the binary narrative between neutrality to politics. It confronted aid organizations like Oxfam with the limits of their relief programs and exposed the tensions between the politics of humanitarian aid in the global South and their apolitical representations in the West. The further reading is in no way a comprehensive list but rather serves as an introduction to the history of the Ethiopian famine as well as the longer history of famine relief. Barnett, Michael and Weiss, Thomas G. Humanitarianism in Question: Politics, Power, Ethics (Ithaca: Cornell University Press, 2008). Waal, Alex, de. Evil Days: 30 Years of War and Famine in Ethiopia (New York/London: Human Rights Watch, 1991). Weizman, Eyal. The Least of All Possible Evils: Humanitarian Violence from Arendt to Gaza (London/New York: Verso, 2011). Davis, Mike. Late Victorian Holocausts: El Niño Famines and the Making of the Third World (London: Verso, 2002). Forth, Aidan. An Empire of Camps (PhD Dissertation, Stanford University, 2012). Sasson, Tehila and Vernon, James. ‘Practicing the British Way of Famine: Technologies of Relief, 1770-1985’. European Review of History 22, No. 6 (2015): pp. 860-872. Tehila Sasson, In the Name of Humanity: Britain and the Rise of Global Humanitarianism (PhD Diss. University of California, Berkeley, 2015). Vernon, James. Hunger: A Modern History (Cambridge: Belknap Press of Harvard University Press, 2007). Dr. Tehila Sasson is a past and present Postdoctoral Fellow at the Institute for Historical Research, London and a visiting fellow at the Centre for History and Economics, Cambridge. In fall 2016 she will be joining Emory University as an assistant professor of history. She is currently writing a book on why a large international community came to act in the name of humanity in the second half of the twentieth century. Her research received support from numerous organizations including the Woodrow Wilson Foundation, the Mellon Foundation and the American Historical Association. She also has a forthcoming article in October 2016 at the American Historical Review, entitled ‘Milking the Third World? Humanitarianism, Capitalism and the Nestle Boycott’. Tehila was a participant of the Global Humanitarianism Research Academy (GHRA) 2015. Citation: Tehila Sasson. ‘Ethiopia, 1983–1985: Famine and the Paradoxes of Humanitarian Aid’, in Online Atlas on the History of Humanitarianism and Human Rights, edited by Fabian Klose, Marc Palen, Johannes Paulmann, and Andrew Thompson, 2015-12, urn:nbn:de:0159-2016090546 [2019-04-21].